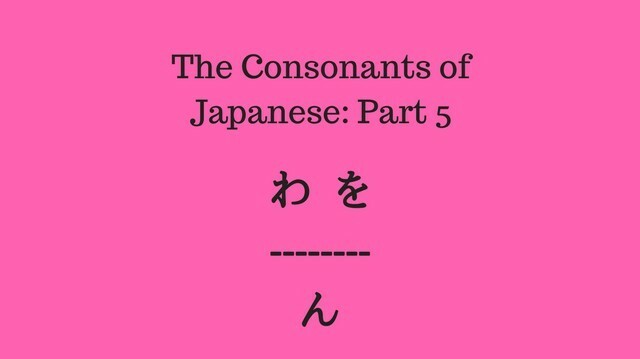 In this lesson we will wrap up all of the basic hiragana and their corresponding sounds in Japanese. We aren’t quite done with consonants, but after today you will have accomplished a lot so it is appropriate to take a slight break. But that doesn’t mean that today will be short! There’s a lot of information to learn today, so let’s get started. Something I want to briefly touch upon is the を [wo] sound in Japanese. Technically speaking, the correct way to pronounce this kana is [wo]. Having said that however, when Japanese people speak at a natural pace, this sound almost always gets changed to just [o] since it is easier and more natural to just make an [o] sound in the middle of conversation rather than a [wo] sound. You will still hear [wo] used every now and then, so just be aware that both are correct. As for the ん [n] sound, it is actually pretty special since it is the only consonant in Japanese that doesn’t get combined with a vowel! The reason for this is because ん is never used at the beginning of a word! You will only ever hear it in the middle or at the end. In addition to that, the sound will change slightly depending on the consonant or vowel that immediately follows it. The more focused time you spend listening to Japanese, the better you will become at it. At some point, you won’t need to remember these rules anymore because the sounds will have become a part of you. The reason why I explain all of the sounds is because when you are aware of the sounds, you can then learn them at an accelerated pace! You will normally pronounce ん as [n] like you did with な-に-ぬ-ね-の. To get technical, you make this sound by lightly pressing the tip of your tongue to the roof of your mouth. Pronounce ん as [m] like you did with ま-み-む-め-も when it comes before a [m], [p], or [b] sound. Pronounce ん as [ng] (like the English word “song”) when it comes before a [k] or [g] sound. Pronounce ん as [N] when it comes at the end of a word and there is nothing after it. Unfortunately, this [N] sound doesn’t exist in English, so I can’t give you an example, but it is really close to the [ng] sound that I just explained previously. In fact, most Japanese people will switch between [ng] and [N] subconsciously without even noticing! So go ahead and listen for it, but don’t worry too much if you accidentally make the [ng] sound instead of [N]. ん, んん Good. Good words that is! Time to Lock the New Information In! I don’t really think you need to practice these individual sounds all too much since we only covered three new kana and they are pretty easy for most people to pick up. Write down each kana a minimum of five times. Rehearse the words five times each. You’ve now learned all of the sounds that are represented by the basic hiragana! But we’re not done yet. There are actually still quite a few more sounds to go over. I want to take a slight brake here, so the next lesson will be a bit different from what the last ones have been like. I’ll also be giving you a free chart that has these basic hiragana that you’ve learned so that you can have them all in one place. Then once we are done with the next lesson, we’ll get right back into the sounds of Japanese by seeing how the hiragana you already know gets altered slightly to represent these additional sounds. Go Back to Lesson 7! I actually just watched a video by Dogen today on the を sound and how you are supposed to pronounce it! He basically said the same thing, that either way is correct as long as you pick one and stay consistent with it. Something I didn’t know before was that (wo) is historically correct, which is why a lot of people still use it, but (o) is the “correct” way to pronounce it in Modern Tokyo Dialect. Something that other readers who don’t follow Dogen might benefit from is that if you choose to use the old pronunciation of を, it should be less of a (wo) sounds and more of a ぅお sound. Start with a little ぅ and then move to the primary お sound. Haha, hey I support Dogen on Patreon too! I watched that lesson as well and was pretty impressed. I had never heard about pronouncing 「を」　as 【ぅお】　before, but he convinced me in a few seconds with his explanation and audio examples. At any rate, I pronounce it as 【お】so there’s no problem on that end of things.